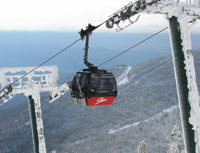 Stowe Vermont is classic New England skiing. Stowe makes our favorite place to ski list for many reasons. Surely you have heard about the legendary Front Four – some of the steepest trails on Vermont’s highest peak – Mt. Mansfield. We love Stowe for the New England ski terrain, spectacular Vermont views, and the on mountain village,complemented by Stowe’s authentic village in town, and some of the best après ski in snow country. Stowe Mountain Lodge and Spruce Peak Village with a Spa and Performing Arts Center is very Beaver Creek comes to Vermont. 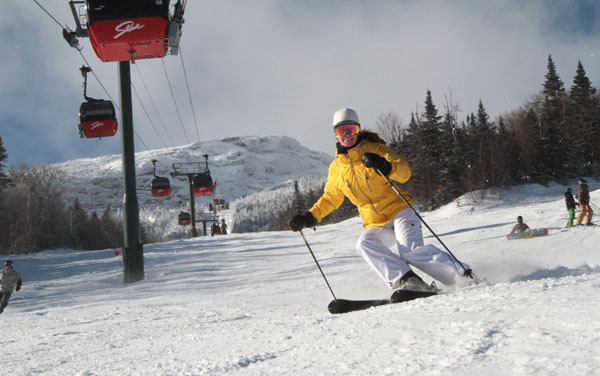 Vail Resorts bought Stowe Mountain! This is an Epic addition to Vail’s Epic Pass , when you consider lift tickets at Stowe are $124 a day, the pass is around $800 for 13 resorts! There is more to the story at Stowe than skiing laps on the swift Forerunner Quad. There’s scenic lunch at The Cliff Lodge atop the bright red Gondola, or at Stowe Country Club’s Cottage, then spa treatments at the Stowe Mountain Lodge followed by après ski at the Hourglass, or a visit to the quaint village of Stowe, Vermont’s Ski Museum on Main Street, the Trapp Family Lodge Brewery, or Picnic at Field Guide.